THOUGHTSKOTO Thoughtskoto : Seaman's Wife Killed 3 Own Kids, Bad Spirit Possession? 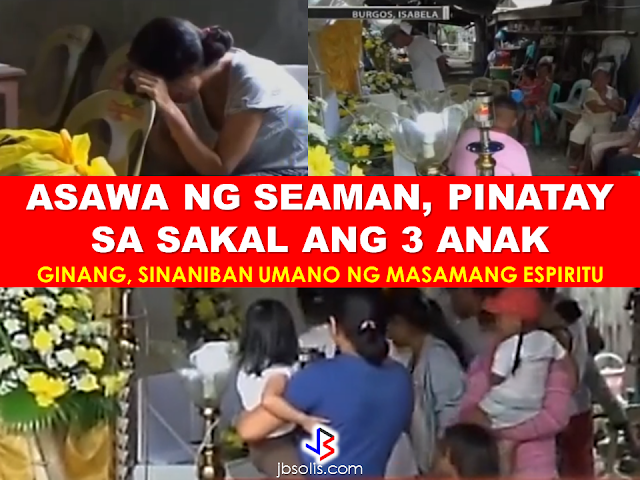 Seaman's Wife Killed 3 Own Kids, Bad Spirit Possession? Burgos, Isabela: Three kids including a 3-month-old baby died of strangulation in the hands of their own mother. GMA News report said that the mother is facing multiple parricide charges for taking the lives of her kids with ages three, two and a 3-month-old baby. Their relatives found out about the horrific incident when her 7-year old kid got away and sought the help of their grandparents. The woman is believed to be undergoing severe depression. The suspect insisted that there was an evil spirit that had her possessed and caused her to do the violent crime leading to strangling of her own kids. Her husband who work overseas as a seaman is scheduled to come home to find out that he tragically lost three of his beloved children in the hands of their own mom.